This entry was posted in Campus Announcement, Community and tagged oaks, Toomer's Corner on February 7, 2014 by Wire Eagle. AUBURN UNIVERSITY – The Auburn University Board of Trustees on Friday, Feb. 7, approved a plan to redevelop and enhance historic Toomer’s Corner. Work will begin this spring to replace the soil contaminated by the 2011 poisoning and finish with the planting of two new trees in early 2015. This first phase of the Samford Park redevelopment also will feature the construction of a circular wall that will allow a larger number of visitors to sit and enjoy the area. Phase II of the project, which will be completed at a later date, will create a tree-lined walkway from the corner into Samford Lawn. This entry was posted in Campus Announcement, Events and tagged oaks on March 20, 2013 by Wire Eagle. 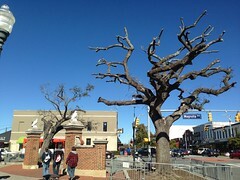 AUBURN UNIVERSITY – After two years of extraordinary efforts to save the poisoned Auburn Oaks at Toomer’s Corner, Auburn University plans to remove them on April 23, weather permitting. The final opportunity for fans to roll the beloved Auburn Oaks will follow the A-Day football game April 20 when the university and City of Auburn host a “Celebrate the Tradition” block party.